I don’t know why I ended up in Majuro. Truthfully, I planned on going somewhere completely different. But God had something else in mind. Yokwe! * I’m Stacy, and I was a volunteer in Majuro, the capital of the Marshall Islands, which are about half-way between Hawaii and Australia. Though I had dreamed of being a volunteer since I was a child, I don’t really know why I ended up in Majuro the first time. Truthfully, I planned on going somewhere completely different. But God had something else in mind. “‘For My thoughts are not your thoughts, nor are your ways My ways,’ says the Lord.” ** Let me share a little further. One day in Bible class, after I had read a story, I started asking my fifth graders questions to see what they had heard and understood. I did this on a regular basis, so it was nothing new. However, this day was different. I don’t even know how it happened, but all at once they were throwing questions at me from all directions – good questions – that were deep and probing. The students were very serious and they really wanted to know the answers! Afterward, I couldn’t believe it had happened. It was so exciting to me! This was what I’d dreamed of – helping these kids get to know and love Jesus more. Let me tell you, I was thrilled and I still am! God is good! One thing I shared with them is how God loves good and bad people and that He’s going to do what’s best for everyone. I told them how one day, Jesus will take those who love Him to live with Him forever in Heaven. He knows that those who don’t love Him wouldn’t be happy in Heaven, so the most loving thing for them is to “sleep” and not know anything. I hope and pray they understood and that it drew them to Christ. When we weren’t teaching, one of the things we volunteers enjoyed doing was camping. On our first camping trip, we decided to go to an island that could be walked to during low tide. We left later than planned and the tide was already rising, so we had to go quickly. It was difficult in some areas because the water was flowing into the lagoon, making the current pretty strong. We passed several small islands and I was beginning to feel tired. Finally we stopped, and another volunteer pointed to the next island to let us know that it was our destination. Between us and that island was a huge expanse of water, by far the largest we had crossed yet. The current was strong and the rocks slippery, but we finally made it across. We set up camp, hanging up hammocks and getting a campfire ready to cook supper. Then we settled down to relax. It was breathtaking! Talk about a topical paradise! There was no one there but the six of us and a beautiful blue ocean. After cooking supper, we sat around the campfire eating s’mores and telling “most-embarrassing-moment” stories. At night I was a little worried about going to sleep because rats liked to crawl around in the trees in the dark, but fortunately we heard no rats that night. I slept pretty well, considering a hammock isn’t the most comfortable place to sleep. In the morning we ate breakfast, walked around the island (it was quite small), got in the water, and just hung out and relaxed. It was wonderful! In the early afternoon we headed back to the school. What an amazing little adventure that was. I thank God for providing us with a world filled with so much beauty and for giving us time to rest and relax! He has truly blessed each one of us! I remember another time when God blessed me greatly. It had been a tough week. Towards the beginning of it, I had really been struggling with some things, and Satan was hitting me very hard. Nevertheless, God is faithful. My week turned out well thanks to His ever-present love. I won’t go into details, but I will share a couple examples. On a night when I was deeply struggling, I saw a shooting star. I felt God was saying to me, “I love you. I care about you.” The next morning I went out to the rocks in front of my apartment to have my devotions and watch the sunrise over the ocean. I asked God to allow me to see dolphins because many others had seen them, but I never had, and I really wanted to. I finished with my worship and still there were no dolphins. Disappointed, I returned to the apartment to get ready for school. But like I said, God is faithful. That very same day, during recess, my kids starting shouting and pointing at the ocean. I looked in the direction they were pointing and sure enough, there was a large pod of dolphins swimming by. It was so cool! Again, here was God telling me how much He loved me. There were many other times throughout that week when little things would happen, but they were just big enough for me to hear God saying He cared. He cared about me. Isn’t God good? Being a volunteer has truly changed my life. It has changed my outlook on life. It has created in me a lifelong desire to serve our God. Yes, it’s amazing to see the moon rise right out of the ocean. I can’t even begin to explain how beautiful it looks. It’s absolutely gorgeous. But what’s even more amazing is seeing and feeling God use me to be a blessing in the lives of others, like the students I taught in Majuro, as well as my fellow teachers. I pray that you may feel God tugging at your heart, so that you may be used by Him to bless others also. Stacy Clements is originally from the United States. 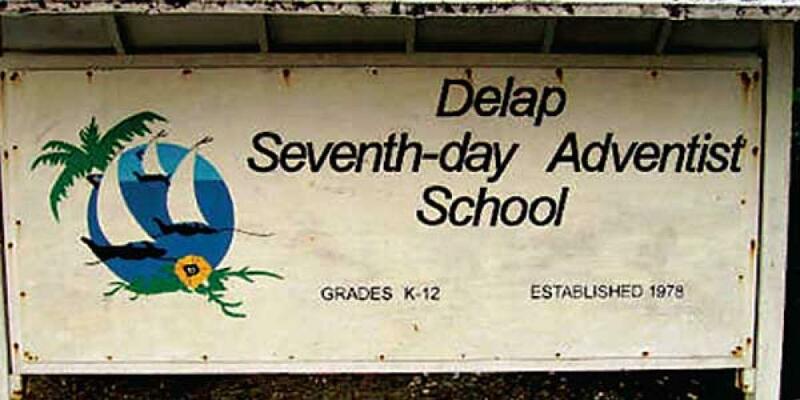 She served as a 4th and 5th Grade Teacher at the Delap SDA School on the Marshall Islands. She first served from August of 2002 to June of 2003 and then returned to serve again from August of 2006 to June of 2007. Stacy hopes that this article may be a blessing in the lives of others who might be considering volunteer service.